Welcome to Wheel: a perfect world without poverty, disease, or want. Tinkered and tuned in every way for maximum order by Rank and Spoke, every child knows her destiny - so long as she can take the neural implant. The defective, whose bodies reject the implants, do not exist. Ghosts. Cyphers. Haunting the edges of society, living on scraps, killed for sport. A lucky few, the Crudrats, scrape out a perilous living cleaning the toxic wastes from the great machines that power the station. Meet Maura. Cypher. Crudrat. Grown too tall, alone in a spaceport with no use for her, doomed to starve. With only her crud-eating murmel and an alien monster to help her, she must find a way to survive, or escape, before they catch her and blow what's left of her life, and her companions, into space. From the pen of Gail Carriger, ArtisticWhispers Productions presents an unabridged full-cast young-adult adventure that brings golden age-style science-fiction into the 21st century, stuffs it full of heart and gives it a finely polished, gleaming edge. ©2009 Gail Carriger (P)2014 ArtisticWhispers Productions, Inc.
wish more books would do this. I loved how this book was read. the story is also fantastic. But a whole cast reading a book is my new favorite way to listen to one. The pitch and volumes of the various cast members seesaws distractingly, to its detriment. The story tone is a change for Carriger. I've loved her other series for their witty dialogue and laugh out loud action. 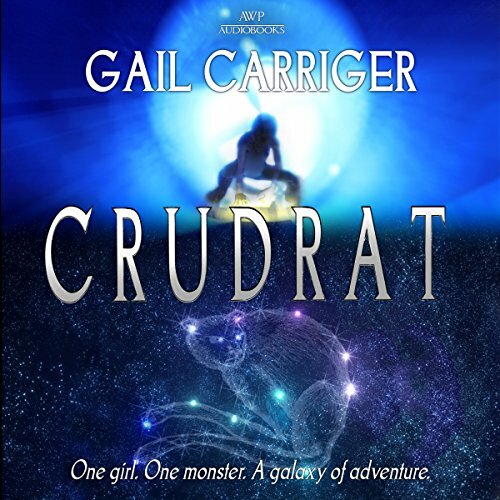 Crudrat is a fast moving story without the humor of the author's previous offerings. The world building is solid and clearly this is the first in a series. But this is geared more for a middle grade reader more than the Parasol Protectorate, Finishing School, and Custard Protocol series. Take it or leave it. It's a quick read or listen. I have been a fan of Gail Carriger since discovering the parasol protectorate, so didn't think twice about trying this audiobook. Although the full cast approach took some getting used to, it was a really enjoyable experience, and another fantastic story by this author. Please, please, please write a sequel soon! Entertains, Surprises, Delights! My new favorite! Would you listen to Crudrat again? Why? Choices of cast, music, and sound effects make the world of the young Crudrat come alive and set a pace which almost mimics the fast and deft movements of the young "cypher" as she jumps, flips, and runs through the perilous tunnels she must to earn her share of air and food. The quality of the performance and the story itself have led me to return to this book and listen again and I confess, again! What was one of the most memorable moments of Crudrat? Crudrat and "Fuzzy" walk into the community meal hall and Crudrat is awed by the quantity of food just left out for anyone to eat. Her delight and incredulity lead her to squirrel a little of this and a little of that into the pockets of her threadbare clothes. Crudrat's work partner the composed and self-assured mermal (catlike creature), Biscuit finds himself in the embarrassing situation of 0 gravity! This is a small example of many favorite scenes. There is a moment when Crudrat tells Fuzzy's Aunt, Manzanilla, the ruler of the city, how she has experienced recognition and value in her city, beyond anything she experienced in Crudrat's own world that branded her "cypher", of no value. This is an example of the successful combination of a good story with a good performance creating an outstanding audible book! I enjoy most of this author's work. I gave this a try. The story is excellent. It's a world easy to visualize. The characters are great. A good space adventure. loved it, funny as all Hails books, wonderful characters, story and hope for even the unwanted. horrible. too fast paced. nothing to do with previous bòoks from this author. could and did not want to follow. the music was very distracting and didn't fit the narration very well. the book would have been MUCH more enjoyable without it in the background. The book was great though, I want a sequel! I love this author. I have read all of her other series. I especially enjoyed this new story and look forward to the next in the series. The cast performance was really well done. BUT I have to admit it took a few "clicks" to adjust to the narration by J. Daniel Sawyer. It just seemed really slow. Surprising when you find out he also does some of the best voices in the script. The story was intriguing and the acting great. Like all Gail Carriger books, Crudrat introduces a complex world, so different from ours. I do hope there are plans to continue writing more books in this world. I love all the books Gail Carriger has written and the audio performances always bring the stories to life. Not the same.e as Gail's other books but I enjoyed read it and now listening to it. Will there be more? I do hope so.